Sept. 20 — After multiple hacks of Democratic Party e-mail systems and fears of Russian cyber attacks on the U.S. election, paper ballots have taken on an unexpected appeal. Online voting software companies are convinced convenience-loving Americans will increasingly push to cast their ballots on smartphones and laptops, and they're working to make that happen. But voter advocates, election officials and others are still leery of the risks involved in conducting elections over the all-too-vulnerable internet. For now, fears about voting security may be giving paper-ballot backers the upper hand where it matters most: Americans' confidence in the integrity of the election system. A handful of privately-owned companies developing online voting software worldwide, such as Sctyl, Everyone Counts Inc. and Smartmatic International Corp., say their technology is not only ready but crucial for the U.S. to adopt, as aging voting infrastructure and lost mailed ballots loom as larger security risks. “Let’s face it, everyone wants to be the next Uber, the next disruptive tech, and we’re doing that with voting,” said Marc Fratello, an executive advisor of Scytl, which has developed online voting software for use by overseas and military voters in France and portions of the population in Switzerland and Norway. The company said it controls 87 percent of the online government voting market. In the U.S., online voting via e-mail, fax or internet portals is limited mainly to overseas and military voters in 32 states and the District of Columbia. Other countries, such as Estonia, have offered nationwide online voting since 2005. In the U.S., several states, including California and Virginia, have tried to expand online voting without success for reasons including security and implementation concerns. Vote-by-mail and paper-based systems are on the rise in the U.S. But these methods are far less secure than online voting, Lori Steele Contorer, founder and chief executive officer of Everyone Counts, which develops software for online voting and in-person voting machines, told Bloomberg BNA. Contorer said paper is easy to tamper with or misplace at polling stations, and postal workers do not need security clearances to handle ballots. Contorer founded San Diego-based Everyone Counts with $35 million in private investment and has offered services for private sector elections since 1996. The company’s revenue has doubled in each of the last two years, she said, and it has offered online voting to military and overseas voters in states like Alabama and Utah as well as in parts of the U.K. and Australia. Although select countries have been faster to adopt internet voting technologies than the U.S., the American public—now used to doing everything online from buying a mortgage to renting an apartment—will push for an internet voting system in the coming years, Contorer and other voting software executives told Bloomberg BNA. Recent hacks are a minor setback, they said. Online voting would increase voter participation by allowing citizens to vote from anywhere, Fratello said. In 2012, 54 percent of potential voters in the U.S. cast ballots, according to the Pew Research Center. Internet-based voting also lets blind or disabled citizens vote independently using voice-recognition software or customized adaptations on home computers. Companies also touted the security that internet portal voting offers versus ballots lost in the mail. “This form of remote voting is extremely inefficient, is very, very fragile, many votes get lost,” Antonio Mugica, chief executive officer of London-based Smartmatic, which also manufacturers physical voting machines and other election tech, told Bloomberg BNA. As many as one in five ballots cast by people who attempted to vote by mail—or 7.6 million votes out of a pool of 190 million registered voters—may have been lost in the 2008 election, according to an election study by Charles Stewart III, a professor at Massachusetts Institute of Technology and a director of the Caltech/MIT Voting Technology Project. Mugica, whose Smartmartic has average annual revenues of $235 million, said other countries, such as Estonia and parts of Chile using the company’s online software, are leapfrogging the U.S. in fast, accurate voting technology. Although he said he doesn't advocate for exclusively online voting, he believes Americans will see expanded online voting technologies within five to seven years. In March 2016, Smartmatic software was used in Utah's GOP primary election. The U.S. Election Assistance Commission—which develops voluntary guidelines, tests and certifies voting hardware and software—has not certified any internet voting systems. A commission spokesman told Bloomberg BNA it was not clear if an update to its technical guidelines—slated for 2018—would include language about online voting systems. However, the guidelines committee adopted a list of priorities in September 2016 which include discussions on the risks and benefits of electronically returning ballots. Voter advocacy groups, technologists and election officials say online voting software isn’t ready for public use. “Currently there isn’t a technology that is commercially available today that can protect our election integrity and ballot secrecy—it’s just not there,” said Susannah Goodman, director of Common Cause’s national Voting Integrity Campaign. The National Institute of Standards and Technology, which works with the U.S. Election Assistance Commission to develop voting tech standards, has questioned the ability of current technology to authenticate voters, audit election results and ensure that the millions of laptops, tablets and smartphones that Americans would vote with could be guaranteed to be free of malware. 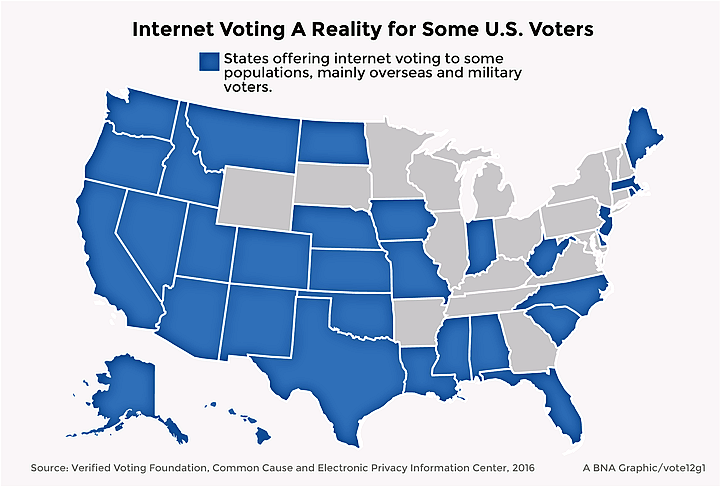 Those who support expanding internet voting are “people who have no idea how hostile the internet environment is,” Joseph Lorenzo Hall, chief technologist and director of the Internet Architecture project at the Center for Democracy and Technology, told Bloomberg BNA. A 2012 study of Everyone Counts online voting software in regions of Australia showed “significant security vulnerabilities and reliability failures,” including misrecorded votes and problems authenticating eligible voters. Inadequate oversight of the system was responsible for some of the blame, the report said, but it did not recommend expanding internet voting to those who can independently use paper ballots. Norway ended its parliamentary election online pilot program using Scytl software in 2014. Government officials said it didn't illustrate significant increases in voter participation, and too little was known about its security mechanisms. Scytl says its software still supports some municipalities for referendums and consultations. In 2014, University of Michigan researchers said “state-level attackers” and “sophisticated online criminals” could hack Estonia’s country-wide internet voting system—which has since become a joint venture of the country's original operator and Smartmatic. An online voting pilot program in Washington D.C. was scrapped in 2010 after hackers took over the system in a matter of hours. “Sometimes old school is better, it’s not always the latest technology that works best,” Pamela Smith, president of Verified Voting, a nonprofit organization that advocates for accuracy of elections, told Bloomberg BNA. Online voting technology should at least be continued to be investigated because Americans have a commitment to allow military and overseas to safely cast ballots, MIT's Stewart told Bloomberg BNA. Currently, it is “virtually impossible” for these voters to receive and return paper ballots in the 45 day window allotted to them, he said, and the EAC has not certified the technology they are now using. The push to expand online voting to a broader population, however, might come down to public confidence in the system, Stewart said.